Forget agreeing to disagree - it’s time to learn How to Be Right. Every day, James O’Brien listens to people blaming benefits scroungers, the EU, Muslims, feminists and immigrants. But what makes James’s daily LBC show such essential listening - and has made James a standout social media star - is the careful way he punctures their assumptions and dismantles their arguments live on air, every single morning. 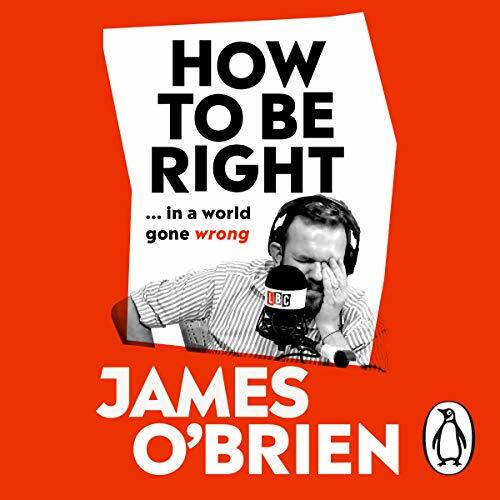 In How to Be Right, James provides a hilarious and invigorating guide to talking to people with faulty opinions. With chapters on every lightning-rod issue, James shows how people have been fooled into thinking the way they do and in each case outlines the key questions to ask to reveal fallacies, inconsistencies and double standards. If you ever get cornered by ardent Brexiteers, Daily Mail disciples or little England patriots, this book is your conversation survival guide. essential reading in these scary times. fantastic, important amd relevant book in the current climate of disinformation and the rise of the far right. Such a great book! My only issue was that it could have been much longer. I wish it were a 15-hour tome, as I could literally listen to the profound logic emanating from Mr O’Brien all day. I found myself feeling a little more hopeful at the end that others are also abhorred at the anti-enlightenment direction some countries are heading in. This shared perspective allows me to at least wish that those on the right side of history will push back and carry humanity back on to the progressive path. James perfectly articulates my own feelings and thoughts in this audiobook. I am always so glad to hear that James has certainty where I have certainty, and ambivalence where I have ambivalence. This book is a real treat - all James - no ads, no traffic reports or PM questions just pure James. Can't wait for its sequel.